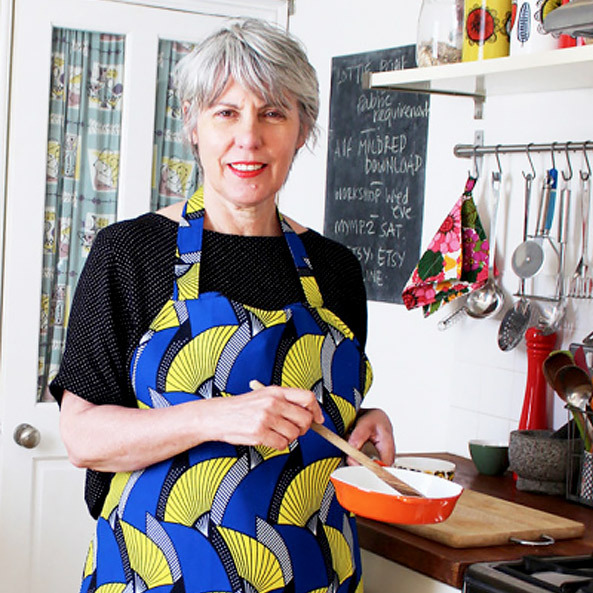 Fiona has worked in the Fashion/textile industry for over 25 years and is a regular contributor to Love Sewing, Sew Popular and Love Patchwork & Quilting magazines. She likes to keep busy but satisfies her passion for sewing and fabrics by passing on tips and information to others. Fiona lives by the sea with her husband, the artist Marko, twins Alfred and Matilda and Madame Mabelline (the cat). 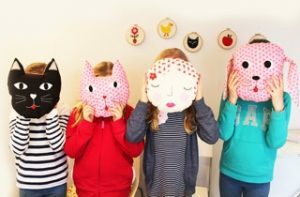 Fiona is a regular tutor at the Workshops/classes held by Eclectic Maker in Worthing. I can’t remember exactly how old I was when I first started sewing, probably about 6/7 years old. My mum was a big influence on me, she was fantastic at putting colour and fabric together and had a great sense of style, my grandmother was a Tailoress so that must have rubbed off on me. I started by making dolls clothes and a very wonky patchwork throw for my bed. I caught the sewing bug from then on, I think, but I was mainly self-taught. 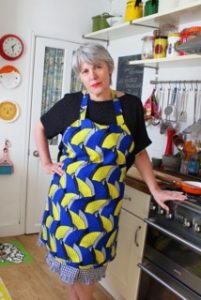 I eventually went on to do a degree in Fashion and Textiles and worked as a Fashion Textile Designer for over 25 years. Stitch – I love appliqué and do a lot of machine embroidery which I enjoy but when I’m making clothes. I love a bit of hand tacking – it slows everything down, oh and top stitching is another favourite, I love the effect of accentuating a seam that it brings. and it has lots of top stitching of course, actually I think this is probably my favourite thing I’ve made, I do wear it a lot! Hmm……. thinking about it I do love my walking foot attachment, it makes sewing a pleasure, I love the way it eases the fabric through the machine…. and my darning foot too for when I machine embroider – we are having a Sew a Selfie workshop at Eclectic Maker soon, the darning feet will be in action to stitch our own portraits, it will be lots of fun. I love colour but over the last year I’ve become more sober with my taste, I used to go for strong vivid colours and patterns, now I’m more likely to go for indigo blue, it looks great with white. I love linen, it hangs so well and is a dream to work with when making clothes. Although it does crease quite a bit – but I don’t mind that. I prefer to machine sew but I do like hand tacking, it’s the bit where everything slows down and you can connect with your project and take time to enjoy the process. 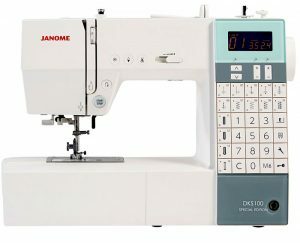 Well…… I’d like to get myself a Janome DKS100 with an orange panel but only because it looks nice! I can’t think of any, if there are any I’ve erased them from my mind and stuck them in a very deep dark drawer! Most of my sewing tends to be projects for magazines, it’s my job to come up with new ideas and projects for others to sew – a dream job in my books. Also, at the moment, I am doing some banners and stitched sweatshirts for my husband’s brand, we are taking them to the DIY art market in London soon so I’m hoping they will go down well there. I would love Agyness Deyn to model or sport my clothes designs – she is so cool! I always play radio 6 when I’m sewing – but if I had to choose something in particular it would probably be a tune with a funky dance beat to get me going. I am not a particularly early riser, but I do stay up quite late sometimes when I’m totally absorbed by something I’m working on. I feel it the next day though!. Music, cinema, gardening, rambling are my other interests, walking on the Sussex Downs – there is nothing better! Well I do admire Merchant and Mills, they have a mixture of sewing patterns, haberdashery and fabrics – I just love their style. I’m very influenced by the fashion brand ‘Toast’ when designing my patterns. My advice to a newbie would be to love what you do and express your own creativity, don’t get hung up on technique or perfection just enjoy it! 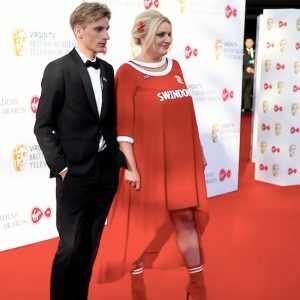 Fiona and her creations are often published in various sewing magazines but her most famous dress to date is the one she made for the 2018 BAFTAS award ceremony. Fiona says her initial reaction was one of trepidation. But when she found out it was for her friend Jane’s niece, Daisy Cooper, one half of the talented ‘This Country’ BBC 3 comedy duo, she just couldn’t resist. Daisy aka Kerry Mucklowe and her cousin Kurtan (real life brother and writing partner Charlie) are a hapless pair of ‘yoofs’ getting up to all sorts of trouble in a quiet Cotswold village. The series was up for several awards including Best Scripted Comedy and Daisy was nominated for the Best Comedy Actress (which she won!). Together, Daisy and Charlie had were presenting the ‘Best Soap’ award, one of the highlights of the evening; Fiona says on her blog that ‘to say I am feeling the pressure would be an understatement’ but equally she was ‘over the moon’ to be involved in this amazing opportunity. Fiona goes into more detail about the design and creation of the dress here on her Blog. 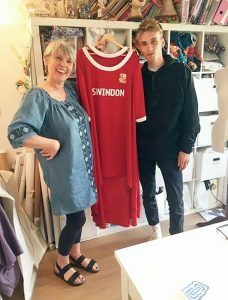 Pictured here is Fiona Hesford and Charlie Cooper who was tasked with the collection and delivery of the very important dress. Thank you to Fiona Hesford.